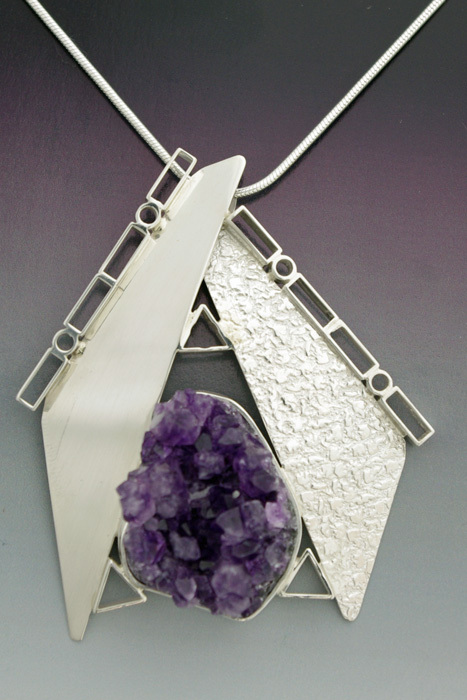 Texture Jewelry - This is a bold statement Sterling Silver pendant that is accented by a beautiful geode purple Amethyst crystal. This pendant is complemented by an 18" snake chain. Natural geode amethyst surrounded by contrasting textured and high polished sterling silver. This pendant is a one of a kind. Be original! The necklace includes this 18'' Sterling Silver snake chain. This hand fabricated necklace is signed and created by Aaron Rubinstein and Modern Art Jewelry.